The comic grotesque is a powerful element in a great deal of Elizabethan literature, but one which has attracted scant critical attention. 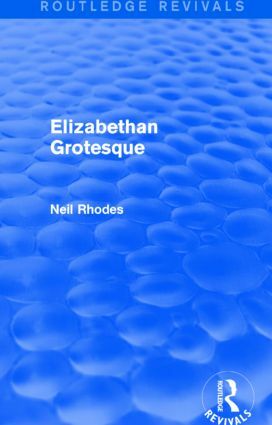 In this study, first published in 1980, Neil Rhodes examines the nature of the grotesque in late sixteenth-century culture, and shows the part it played in the development of new styles of comic prose and drama in Elizabethan England. In defining ‘grotesque’, the author considers the stylistic techniques of Rabelais and Aretino, as well as the graphic arts. He discusses the use of the grotesque in Elizabethan pamphlet literature and the early satirical journalists such as Nashe, and argues that their work in turn stimulated the growth of satirical drama at the end of the century. The second part of the book explains the importance of Nashe’s achievement for Shakespeare and Jonson, concluding that the linguistic resources of English Renaissance comedy are peculiarly – and perhaps uniquely – physical.